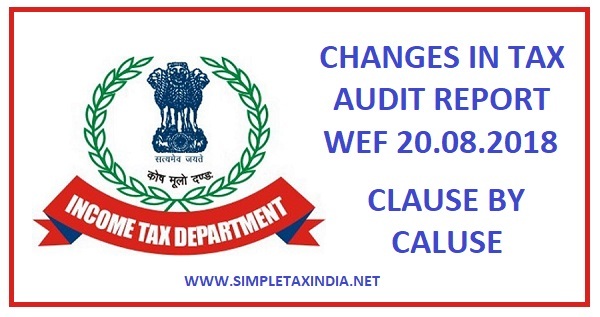 The Central Board of Direct Taxes (CBDT) has issued notification no.33/2018 on 20 July 2018 making amendments in Tax Audit Report for FY 2017-18. The modifications are effective from 20 August 2018. In Our view ,Changes in Tax audit report must be effective from next year only as information regarding data and verification thereof can be done in true sense while auditing the books on regular basis which auditor have already complete during the financial year , now have to ascertain and fetch the new information asked in a manner which may not be satisfactory to themselves. A snapshot of the key changes made in TAR is given below. Accountant to certify whether the taxpayer has received any such income and if yes, the nature & amount of such income. Finance Act 2017 introduced Secondary Adjustment provisions which trigger in a case there is a primary transfer Pricing Adjustment under the prescribed scenarios. In a case where due to a primary adjustment in the hands of the taxpayer, there results an excess cash with taxpayer’s associated enterprise (AE) outside India, such excess cash is required to be repatriated to India within the prescribed time limits. In case where the excess money is not repatriated to India within the prescribed time, such amount is deemed to be an advance made by the taxpayer to its AE and interest is levied on the deemed advance in a prescribed manner until repatriation of the money to India. Accountant to certify details of expenditure incurred by way of interest or similar nature, EBIDTA of the relevant year, quantum of interest expenditure or similar nature which exceeds 30%of EBDITA, & unclaimed interest expenditure eligible for carry forward to subsequent year. GAAR provisions were introduced from 1 April 2017 onwards to deal with aggressive tax planning. TAR to report whether the taxpayer has entered into an impermissible avoidance arrangement. If yes, nature of such impermissible avoidance arrangement & the amount of aggregate tax benefit arising to all the parties concerned. Finance Act 2017 inserted provision to prohibit taxpayers from receiving cash in excess of INR 2 lakh, except in certain situations. This was done towards moving to a more digitized economy. TAR to disclose transactions not complying with said requirement. Earlier, TAR did not require disclosure of unreported transactions in TDS statements if they were furnished within due date. The disclosure of unreported transactions was required only if TDS statements were not furnished within due date. Amended TAR requires the recipient of such dividend to report the quantum of dividend received and date of such receipt. New reporting requirement applies to the recipient of the dividend who is liable to tax audit and not to the company paying dividend. Forms 61 & 61A - Taxpayers to furnish details of SFTs and the parties with whom such transactions were entered. The reporting entity is required to submit details in Form 61A. Similar reporting requirement exists in Form 61 for a separate list of PAN reportable transactions where counter party to the taxpayer does not possess PAN. Form 61B - Indian tax law requires prescribed financial institutions to furnish a statement in Form No. 61B of ‘reportable accounts’ maintained by them. This was done to collect required information to enable India to meet its obligation of automatic exchange of information under FATCA. Accountant to report whether the taxpayer is required to furnish Form No. 61 / 61A / 61B and if yes, the relevant details such as Taxpayer‘s identification number, due date of furnishing respective forms, date of furnishing the said form. Amended TAR also requires the Accountant to report whether submitted forms contains all details or transactions which were required to be reported and if not, list of details / transactions which are not reported. CbyC reporting provisions requires Multi National Entities (MNEs) to report the amount of revenue (related and unrelated party), profits, income tax paid and taxes accrued, employees, stated capital and retained earnings, and tangible assets annually for each tax jurisdiction in which they do business. In addition, MNEs are also required to identify each entity within the group doing business in a particular tax jurisdiction and to provide an indication of the business activities each entity conducts. This information is to be made available to the tax authorities in all jurisdictions in which the MNE operates. The documentation requirement follows a 3-tier approach: CByC Report, Master File, Local File. Accountant to report whether the taxpayer or its parent entity or alternate reporting entity is liable to furnish the CbyC report and if yes, particulars relating to furnishing of such report. Introduced from 1 April 2017, GST is one indirect tax for whole of India on supply of goods and services, right from the manufacturer / service provider to the ultimate consumer. GST is a comprehensive levy and allows tax collection on both goods and services based on the principle of value added tax. Amended TAR requires reporting of details of GST i.e, break-up of total expenditure with GST registered and unregistered entities. In relation to expenditure with GST registered entities, it further requires the break-up of expenditure relating to exempt supply covered under the composition scheme and other registered entities.